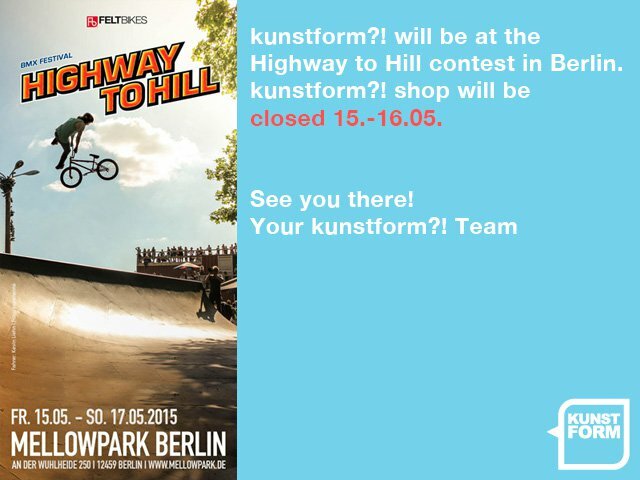 We have send all our staff from 15 May 2015 - 17 May 2015 to the Highway to Hill BMX festival in Berlin Mellowpark. They will recharge energy and motivation that's why kunstform?! BMX Shop will be close on Friday, 15.05. and Saturday, 16.05. At Monday we will be back with new power. Thank you for your understanding and we would be happy to see one of you there.